You've found the “U.S. St. Croix Sheep Breeders” page here at Hobby Farm Wisdom! If this is the first time you have visited our site: Welcome! St. Croix is a breed of domestic sheep that is native to the U.S. Virgin Islands. This breed is sometimes referred to as Virgin Island Whites because when imported to North America, they were selected for white coloring only. In their native environment however, this breed can be brown, black or white. 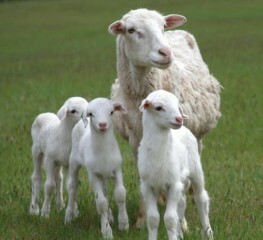 St. Croix sheep are a hardy breed that is known for being parasite resistant and naturally polled. They also have an active but easily managed personality. Ewes are excellent mothers and require minimal assistance. St. Croix has been used as the foundation stock for multiple other breeds, including Katahdin and Royal White. Today, they are raised primarily for meat production.